This entry was posted in Denmark, Germany, Japan, Netherlands, Norway, Serbia and tagged Duchess Elizabeth of Bavaria, Princess Beatrix, Princess Benedikte, Princess Hisako, Princess Katherine, Princess Mary, Princess Märtha Louise, Princess Ursula of Bavaria, Queen Margrethe. Bookmark the permalink. Princess Hisako looks spectacular from head to toe; and I love Princess Anna’s ensemble….tres chic! Princess Hisako seems to be the Emperor’s go-to for these northern European events, she’s a regular regular with this crowd these days, and she always looks thrilled to be there, makes me smile! She looks like she’d be so much fun. I love her whole outfit, although not that bright yellow so much. Her hat is the Japanese equivalent of showing up in a swimsuit, and I applaud her for her daring! Princess Hisako’s hat wins the day for me…it’s lovely on her and so unexpected, given what she normally wears while in Japan! Princess Hisako’s hat was a delightful surprise and I loved it. What really intrigued me was her purse. Does anyone think it might be vintage? But, nevertheless, her hat matched her personality. IBL Bildbyra has good photos of Princess Kelly of Saxe-Coburg and Gotha, Duchess Elizabeth of Bavaria, and Princess Anna of Bavaria’s hats. I tried to post the links but it didn’t work. THANK YOU! I have included the photos in the post. Kelly and Anna wore hats! I’m sorry this screenshot is so low quality but you can see them both in the last row. Thanks for the photo share! I have included this in the post. What an absolutely brilliant collection of hats. There is something I like about each one and best of all, each looks lovely on the person wearing it. If I had to choose one, it must be the sunny yellow one. I’ve never seen a hat like it. I have yet to grow tired of this hat on Margrethe, despite how many times it’s been repeated. Such a great color and shape for her! I find Benedikte’s hat to be less successful; it looks fine on her, but when you linked to that blue milan straw hat, it made me yearn for the return of it because Benedikte looked gorgeous in it! I realize this whole ensemble is the same as that worn for the Dutch state visit a little over a year ago, but with Mary’s hair pulled severely back and up, I thought this look this time aged her, and not in a good way. I really prefer this pillbox with her hair down, and those purple leather gloves I love! I thought First Lady Dorritt Moussaieff looked quite good in this hat, considering Iceland is not a fancy hat-wearing nation at all. Princess Hisako was my absolute favorite of the day! As others have pointed out, if we saw this on anyone else, we would most likely not like it (does anyone else suspect Anne has something hiding in her closet from the 1980s that looks very similar to this? ), but on Hisako it just works so well! I think the bow detailing on this hat gives it a modern touch, and the color is divine for her! I guess it takes leaving Japan for the Japanese royals to have a little more fun haha. I love it with or without the coat. A great color and outfit for Beatrix, but I found the hat to be too small for her; I think it should actually be wider! Märtha-Louise looks so awesome, but I do wish her fascinator had been a little more edgy like her dress, and less delicate. Crown Princess Katherine’s cocktail hat suits her very well, but I do wish she would experiment with color more. And from what I can tell, I like Princess Ursula’s cocktail hat, but I find her shawl to be too pattern heavy, which overwhelms the rest of her look. Overall a fun and very varied selection of hats! Concerning the update: Duchess Elizabeth looked fine, but nothing special, while I did like Princess Kelly’s fascinator, but I think the color washed her out this time. I love Princess Anna’s cocktail hat! The colors and design are great and coordinate very well with her outfit. I must say there is not a hat in this group that I don’t like. They are all lovely. I would have to say the bright yellow would not be a favorite on its own but it is bold and bright and she wears it well. WAY TO GO Princess Hisako! If I saw her hat in a store I’d think it was the ugliest hat in the world but on her it’s so awesome. Great coverage HatQueen. You do such a great job of these huge events. sunny as a daffodil. I also like Martha Louise’s fascinator. This post is a survey of the signature styles of these royals — especially Queen Margarethe, CP Mary, and Princesses Benedikte and Beatrix. Each looks lovely in her own way. I’m giving Princess Hisako top marks, not because I really love her hat, but because she looks like she’s going to a party and is ready for some fun. Other hats I like are Queen Margrethe’s, Princess Benedicte’s and Princess Mary’s. The large bumper is not my favorite style, but I agree that Princess Beatrix looks great. Of the small pieces I like the cafe au lait calot best. It’s nicely coordinated, suits the wearer, and is substantial enough to be noticed. Also the netting is part of the decoration. It seems old fashioned to me when the netting hangs in front of the face as on Princess Martha Louise. Bravo for Princess Hisako! Not only did she step out in an unusual style for her royal family, but she did so with an exquisite ensemble. I love that dress! Heavens! That’s a long list. Queen Margrethe – lovely. Ditto, CP Mary, Princess Beatrix, Princess Benedikte. It looks like a really enjoyable celebration. 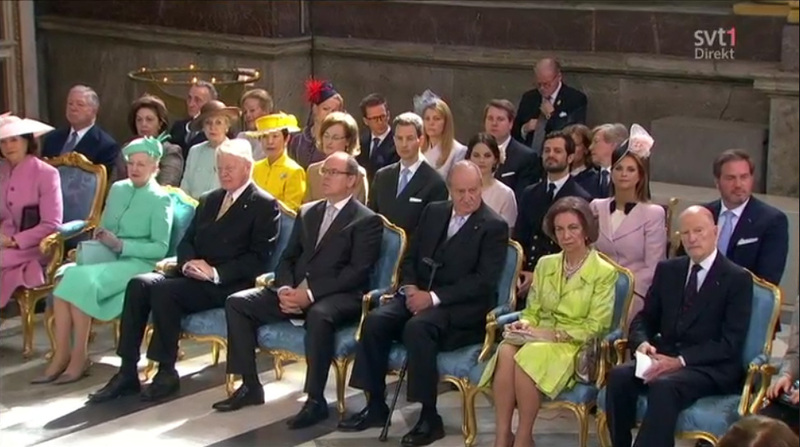 Queen Margarethe and Princess Mary looked great again in their repeated hats, but what stood out for me was the First Lady of Iceland’ s white felt hat and Princess Hisako’ s yellow and white hat. I did think Princess Hisako’ s hat looked best with her white coat on. The yellow hat with the all yellow dress was atop much yellow. But with her coat on I absolutely loved it. The colors, the shape and how it was worn was perfection. I agree with what Intrigued by Royals says: May 2, 2016 at 6:34 pm. Crown Princess Mary’s pillbox was my favourite overall but this was a superb collection of hats!